The Gardens were created by a local Thai Lady (JubJang) who was born on Koh Phangan and has spent her whole life here. She spent most of her life teaching the local children and is well known by the locals on the island. In her spare time, she loved gardening, and this is how the beautiful lush tropical gardens we have were formed. All of the Secret Garden accommodation is set within this space, the unique thing about us is that each bungalow is unique in itself. With every bungalow having its own kitchen, bedroom, bathroom, and outdoor terrace it’s a great hub for you to unwind at your own pace. And with our location being so central going to parties or adventuring around the island is also very easy. All of our standard bungalows have a double bed and spacious sleeping area with room to relax indoors and out. 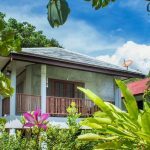 Standard bungalows have a beautiful garden view amongst the mango trees and flowers. 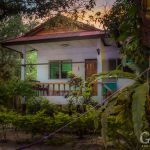 All have their own bathroom and kitchen so you can get settled into life on Koh Phangan at your own pace in Secret Garden style. 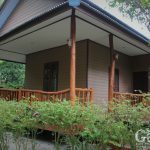 Perfect for those staying a little longer, digital nomads or if you just want more space, our large bungalows come in either Thai-style wooden design or modern concrete. Each has their own characteristics, some including underneath space for alfresco dining, large terraces, views of the garden and only a few seconds walk to the pool. All large bungalows have their own bathroom and kitchen so make yourself at home. Want to be able to hop straight from your bed into our lovely pool in the Morning or as the sun goes down…? Then a poolside bungalow is for you! All are equipped with a double bedroom, kitchen, bathroom, and space to relax whilst still being sweetly tucked in amongst the garden flora.